There isn’t a surefire formula to create the perfect design yet. However, when we take a look at the successful apps, some common design traits stick out. These can provide some clues about the expectations of mobile users. Thus, we wouldn’t be wrong to say that certain user interface design traits make a sustainable app success possible. A functional user interface is among the most important reasons for which users prefer using a mobile app. But not all app owners want to be successful. So what an app creator should consider for the design if they don’t care about the expectations of their users? Users like to find information about the features of the app they have just downloaded. Therefore integrating a guide showing how to use the app can be very helpful. Though, you can still create uninformative, complex and overly intricate descriptions for the sake of creating a useless guide. For a useful user interface though, it is a good idea to avoid overly detailed introduction texts. Similarly, long animations and unskippable videos shouldn’t be in your introductory guide either. Keeping the introduction as simple, short and skippable as possible will be a good idea. Of course, that is if you don’t want your users to get disinclined towards your app. Additionally, you may want to choose a user interface that doesn’t need describing in the first place. The comprehensive apps can be as complicated as they are helpful. An app with many functions tends to end up having to include many menus and tabs. If you want your users to navigate where they want to inside the app easily, you need to design the map of the app in an easy to follow fashion. Without a doubt, the last thing a user-friendly app need is an inconsistent design. In light of this information, you should remember that mislinking pages, important tabs that are not accessible through the main menu, or constantly changing fonts etc. all pave the way to a bad user interface. Aside from these, distracting icons and visual elements and unnecessary information are also among the things your app needs for having a bad interface. Another one of the most important choices in your app’s user interface design may be the choice of colors. It is important to pick harmonious colors between menus, fonts and backgrounds to have an app that is appealing to the eye and the mind of a user. Who cares of that though? You can instead, have it designed according to YOUR tastes, instead what your users may want to see. This way, you may make it possible to get an app that doesn’t even come close to being user-friendly. For example, you may choose colors of the elements of your app in very close tones, so that it is very difficult to read the texts and make the app incomprehensible. Minimalist designs are highly preferred among the mobile app trends these days, as they are quite user-friendly. For achieving a neat and simple mobile app UI, you need to value the quality over the quantity. You may lay the groundwork by choosing a plain font that highlights the content and by not using too many visual elements. Similarly, using white spaces, you may create some breathing space for the elements in your app. Moving on, another good idea is not filling up the margins that make the edges of a screen with content like text and visual elements. Leaving white spaces in margins, and even choosing shades of white for background color, can help with users easier navigation of your app. If, on the other hand, you don’t care in the least about how the mobile users see your app, you may fill all the spaces in your app to your heart’s content. By designing such an interface, far away from simplicity, where all the content stands back to back, you can ensure the immediate removal of your app from the users’ devices. After all, sometimes the best advice is to show what not to do, is it not? As we have outlined above, these bad practices are the opposites of what the successful apps tend to have in their user interface design. Like you can see, the opposites themselves, the right ones aren’t difficult to see and follow. 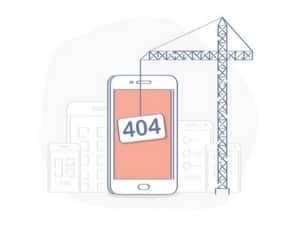 If you want to achieve success with your mobile app, it is critical to design a practical one that fits the users’ expectations, instead of these ironic suggestions. If you want to have an app with a high-quality framework and user interface behind it, create your MobiRoller account now and achieve your goals in no time. User Centered Mobile App is All You Ever Wanted!